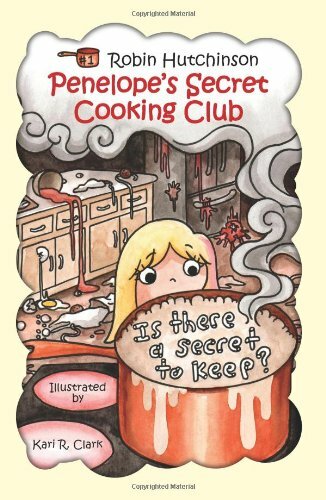 Penelope’s Secret Cooking Club — Is there a secret to keep? IS THERE A SECRET TO KEEP? bubbles over with fun when PENELOPE’S SECRET COOKING CLUB takes over her mom’s spotless kitchen one afternoon. The surprises Penelope encounters when her “new friends” show up in her kitchen to help relieve boredom, keep the reader guessing as to which dish could possibly turn out worse. The sticky, fun mess with a resulting yummy pizza makes Penelope’s adventure in the kitchen quite an amusing read. But will they be able to clean up the huge mess? Phew! Kid friendly recipes wrap up this story for kids ages 6-10. This fun first book in author Robin Hutchinson’s PENELOPE’S SECRET COOKING CLUB series makes the reader’s mouth water for more. I hear Penelope and Robin are soon taking their 2nd story out of the oven and are cooking up their 3rd story in the series. This entry was posted in authors, humor, Kids' stories, reading, writing and tagged cooking, kids' stories, reading, stories, writers. Bookmark the permalink. Penelope’s stories sound like a great fit for 7 year old Allie. Thanks for posting your review, Robin. Am sure Allied will like Robin Hutchinson’s Penelope stories. Want to see one? Yes, Robin, I would like to see one and see how Allie likes it!